Comedy is used for the Joke Star Aspiration and the Entertainer (Comedian Branch only) career. Funniest Joke in the World allows you to be a comedian assassin. It takes 15 points to cause a sim to become Hysterical. 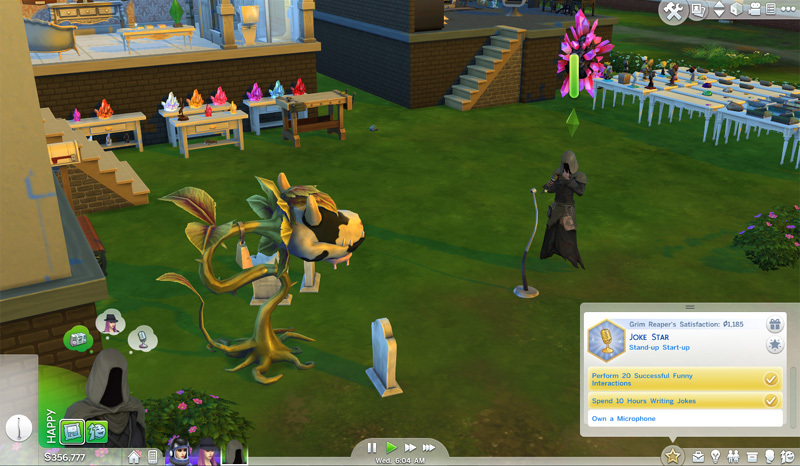 Maintain the Hysterical state and a sim will eventually Die From Laughter. You can get 7 points from decor and another 5 from socialisation. So all you need is one more point to tip the scale. For your own sim, view a Playful Work. For guests, Compliment/Brighten Day. Without the +2 from motives, other quick ways are food and drinks. While there is no Mixology 10 potion for Playful, there is one for Happy. Get Together: The Playful Club Vibe Perk make this very easy. ♥ Goofball – Randomly Playful. For info about the Musician career, see the Music page. (Patched) To Own a Microphone, your microphone needs to be the default gold colour. The game won’t acknowledge the other colours. If you already have one, changing the colour to gold will do it. Grim clearly already has a microphone.